The CBU-87 Combined Effects Munition is a cluster bomb used by the United States Air Force, developed by Aerojet General/Honeywell and introduced in 1986 to replace the earlier cluster bombs used in the Vietnam War. CBU stands for Cluster Bomb Unit. When the CBU-87 is used in conjunction with the Wind Corrected Munitions Dispenser guidance tail kit, it becomes a precision-guided weapon, and is designated CBU-103. 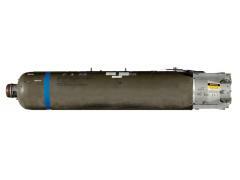 Each CBU-87 consists of an SUU-65B canister, a fuze with 12 time delay options and 202 submunitions (or bomblets) designated BLU-97/B Combined Effects Bomb. Each bomblet is a yellow cylinder with a length of 20 centimeters and a diameter of 6 centimeters. The BLU-97/B bomblets are designed to be used against armour, personnel and softskin targets and consist of a shaped charge, a scored steel fragmentation case and a zirconium ring for incendiaryeffects. The CBU-87 can also be equipped with an optional FZU-39/B proximity sensor with 10 altitude selections.